That was a frackin fantastic episode. 300 - The PG Remix - Click Here for more great videos and pictures! I have one post I'm working on. It looks to be a long one. Something about driving, traffic laws and pink police cars. What does your Linux Distro look like? What have you changed to make it more your own? A related article: How to theme your desktop. FM was the first to link. FatWhiteMan gets bonus points for having my site open in FireFox. 3) Change Oil & Filter 2nd Car. 5) Change Thermostat They couldn't have made it any more impossible. UPDATE: The Chilton and Haynes books are WRONG! There is a nut under the housing that is not shown on any of their diagrams. They point to a nut that just holds some wires out of the way. Those BASTARDS! 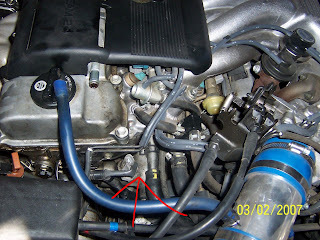 AND there is an aluminum tube that is connected to the housing instead of a rubber hose to prevent the hose from melting. Well they remove the tube from the housing. I tried. But, it turns out the tube is permanently affixed onto the housing. I guess it could screw off or something, but the placement of the tack welds would be... problematic. So far I have only used 34464mb on my desktop. The reason I say this now is my freaking counter reset.